We have worked with many brands. We understand the importance of brand and how it should be used and followed correctly in design and print. We have followed many major brand guidelines to create and develop new promotional print projects for companies including Starbucks, Burger King, KFC and Tesco (to name just a few). Our most recent project for Tesco has involved rebranding and refreshing over 900 Tesco canteens (known as Colleague Rooms) with Tesco branded POS. 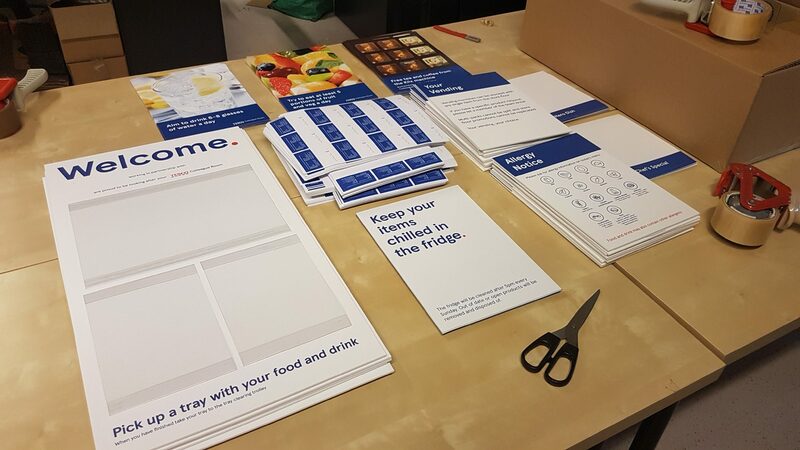 As well as having access to their newly created brand guidelines, our designer and account manager for the client attended multiple brand workshops with Tesco. Working closely with Tesco we were able to produce three different Point of Sale sets for the Colleague Room’s throughout the UK. The POS included foamex information boards, struts, magnetic signs, SAVs, posters, shelf edge labels, acrylic holders for never tear flip cards, product labels, and pos hardware supplies. We are currently in the process of sending packs out in stages every week over the next few months. We have also set up an online ordering system for sites to order additional POS. The initial feedback from the Tesco client, sites and ops managers has been excellent. We worked hard on this project to create good looking packages which, although slightly different from front of store, continues to follow the Tesco branding. There were many amends and plenty of meetings throughout the project. Tesco were kept continuously updated throughout the project and all deadlines were met. Our attention to detail, excellent customer service and great pricing ensures we can produce top quality branded projects at an affordable cost. Once you have your brand you do not need to continue to use a creative agency with extortionate prices and slow turnaround times. Come to us and we’ll be able to help take your brand further. Speak to us at 023 92 293050 or contact us at sales@ukflyers.com for more information and find out what we can do for you.